The Jehovah's Witnesses were started in Pennsylvania in 1870 by Charles Taze Russell (1852-1916) as a result of Bible study among friends and followers that emphasized the second coming of Christ. Russell imparted to his followers that Christ would return to earth spiritually in 1874 in order to prepare for a personal reign in 1914. In the meanwhile, God, or Jehovah, would single out those of goodwill that he wished to save and destroy the wicked. Then, when the time was right, Christ would lead the righteous (i.e., the hosts of heaven and the angels) to destroy the forces of Satan totally at the final battle of Armageddon as the population looked on. The just would then be permitted to reproduce and prosper without dying for a thousand-year reign, and a select group of the just-144,000 Christians-would then ascend to heaven with Christ in order to rule at his side. It was Russell's promise that "millions now living will never die." Despite controversies, court battles, schisms, and the failure of Russell's predictions regarding 1914 to come true, Jehovah's Witnesses have grown in numbers. By the early 2000s there were more than 1.8 million Witnesses in the United States in nearly 11,000 congregations, or Kingdom Halls. There are nearly 16 million adherents worldwide. North Carolina is ranked in the top 20 among U.S. states in the number of Jehovah's Witnesses, with 0.8 percent of the total population professing the faith. Frank S. Mead and Samuel S. Hill, Handbook of Denominations in the United States (10th ed., 1995). M. J. Penton, Apocalypse Delayed: The Story of Jehovah's Witnesses (1985). 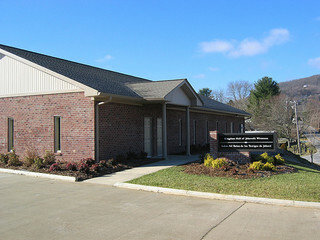 Kingdom Hall of Jehovah's Witnesses, West Asheville. Image courtesy of Flickr user Michael Sprague. Available from http://www.flickr.com/photos/msprague/74238041/ (accessed June 11, 2012).